Tonight will be the night you go to bed early and wake up early tomorrow. The day of fun and filled with activities where you see all the new presents, toys and things that Santa left on his special visit. I must admit kids…I am a little jealous. You see I am all grown up now, so Santa does not visit me anymore. Oh, do not worry too much – he visited me for years! But, there was one year I almost messed it all up. There was one year I did not listen to mom and dad and go to bed – Nope, instead, I decided to catch Santa. It was late in the night. Instead of going right to sleep – like I know you will do – I stayed awake to catch Santa. At one point, I heard a lot of moving around in the family living room. So, I decided my time to catch Santa had finally come. I got out of bed and carefully, and very quietly, walked down the hallway. The living room was dark, but I could see with the light shining through the window that toys were well placed around the tree. Sad that I had missed catching Santa, I looked around the room when all at once I saw him! That’s right! I saw Santa and he was sitting in one of the chairs in our living room. Suddenly I remembered all the stories about why I should be asleep when Santa comes. Most importantly, I remembered that if Santa saw you watching him or you caught Santa, he would take all the presents away! Scared, I ran back to my bed, jumped in and covered up. Worried I had just ruined Christmas for the entire family, I fell to sleep quickly. Well, I was lucky. The next morning all the presents were still in the living room. I looked at the chair where I had seen Santa sitting and can you guess what I saw? Can you? Well, right there in that chair was a big, round, stuffed turtle for my sister. I could not believe it. Santa had actually put that turtle there so I would think that was what I saw at night and not Santa. I will tell you this – after that I knew two things for sure. First, I was never going to disobey my parents again…especially on Christmas night. I was going to sleep when I was told to go to sleep! The second thing I knew was that Santa was a smart fellow. He knew that leaving that turtle in the same place where I saw him would make me think I saw a stuffed turtle instead of Santa. I am happy to report that Santa visited me for many more years before I grew up. So, on this Christmas night when your parents say it’s time for bed, close your eyes tight, go to sleep and dream…in the morning, you will likely find that Santa has visited you too! 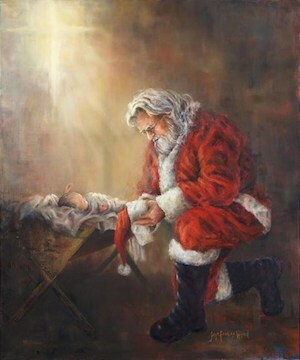 Merry Christmas Kids….young and old!